The ChatRoom Has Been Discontinued. However, if you like Facebook or Myspace, you will LOVE our new social network. It's just like Facebook, but just for providers, support coordinators, self advocates, parents, and other people who are interested in disability information and advocacy. For People Who Are PASSIONATE About Helping People Who Have Disabilities. UNITE With Those Who Are Also PASSIONATE About Improving The Lives Of People Who Have Disabilities. 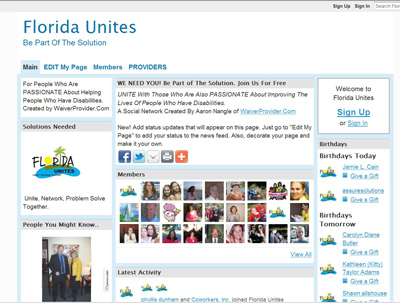 Florida Supports Unite is an interactive online social network that is free and easy to join. Created By Aaron Nangle of WaiverProvider.Com.